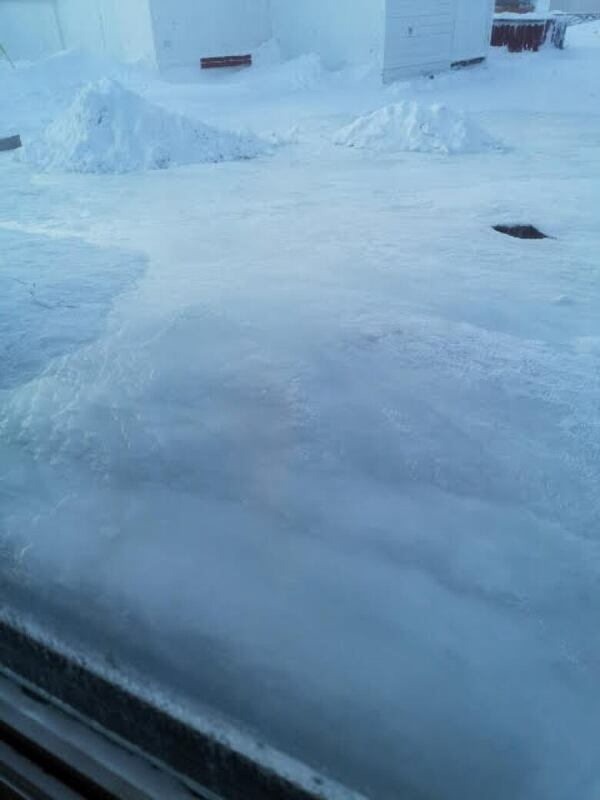 A family in Rankin Inlet is disappointed by how long it took to get an emergency repair on their home through the Nunavut Housing Corporation. 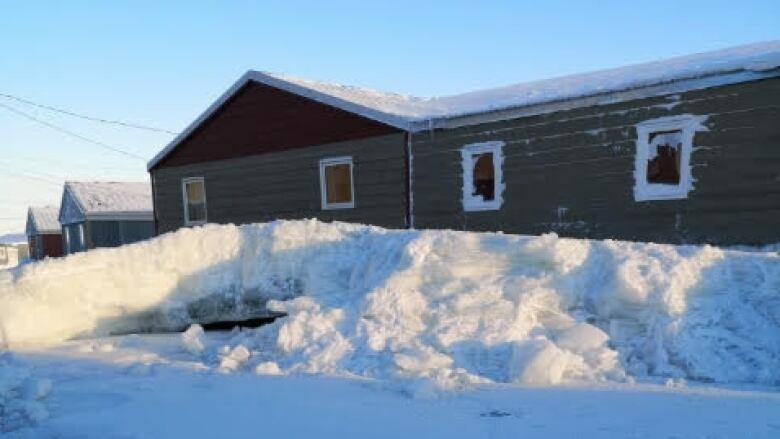 A thick sheet of ice has formed behind a house in Rankin Inlet, Nunavut, pushing up against an outside wall and shifting the home on its foundations. On Dec. 27 Lorraine Gordon and her husband were walking to the store when they noticed the waterline for the house was leaking. "It's like a big frozen lake behind my house," said Gordon. The water has been building up and freezing, making its way to the house. Gordon owns her home through the Nunavut Housing Corporation's homeownership program — making the leak her responsibility to fix. Gordon said she has been on income support for three years and can't afford the repair. In the first week of January Gordon put in an emergency repair program application though the housing corporation. The program offers grants up to $15,000 for people in the homeownership program who need urgent repairs. "They said it's [an] emergency application but I'm really disappointed that it's taking this long," said Gordon. Ten people live in the three-bedroom home, including Gordon's four grandchildren. Gordon's application was approved on Jan. 30, she said. The pipe has now been leaking for six weeks. In situations like Gordon's, when urgent repairs are needed the housing corporation suggests homeowners pay for the repair out of pocket and later be reimbursed when the emergency repair application is approved. The emergency repair program is run on a point-based system to prioritize the most urgent needs, according to the program's policy. There is limited funding available for each community. The housing corporation will pay for skilled labourers to be flown into the applicant's community if no one in the community is able to make repairs. In order for the application to be approved, the resident's income needs to be verified, this is often done through the Canada Revenue Agency. Gordon said the housing corporation is now getting quotes from plumbers in Rankin Inlet to fix the pipe, but in the time she's had to wait for her emergency application to be approved, a whole new set of problems has emerged. "I can't close my bathroom door, I have to force myself to close my outside door because it is shifting my house," said Gordon. Every night Gordon's son-in-law has been using a chisel to puncture a hole in the ice to drain collecting water that's been shifting the house as it freezes. Gordon said she will need to apply to the emergency repair program again in the summer, this time to fix the damage the delay in fixing the leak has caused her home. "I'm just disappointed in this because it's crazy," said Gordon. "It's a slow process." The Nunavut Housing Corporation provided a written statement to CBC with general information about the homeownership program and the emergency repair program. The housing corporation said it does not comment on individual cases and declined repeated requests for an interview.